How much does it cost to travel to Siena? How much money will you need in Siena? 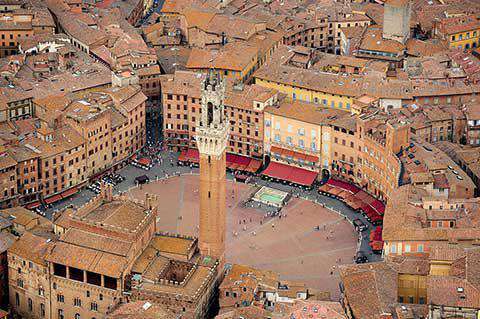 €106 ($120) is the average daily price for traveling in Siena. The average price of food for one day is €41 ($46). The average price of a hotel for a couple is €111 ($125). Additional pricing is in the table below. These average travel prices have been collected from other travelers to help you plan your own travel budget. Located in Tuscany, Siena is a medieval city that is about 70 kilometers south of Florence. One of its most famous events is the horse race, Il Palio, which occurs twice a year during the summer. The race puts a lot of emphasis on neighborhood pride and competition. It is a local tradition that is of great importance to the residence, so it is not an event that is held specifically for tourists. It dates back to the Medieval times and is associated with the area's religion, pageantry and rivalry. In addition to the city's strong neighborhood pride, rich history, and impressive architecture, Siena was also the home of many famous artists including Duccio, Simone Martini, and Ambrogio and Pietro Lorenzetti. Siena's popularity as a touristy destination began during the 19th century. Following its defeat by Florence, it was a very poor city. For this reason most of the Medieval buildings were never torn down giving Siena its beautiful character that exists today. Today Siena is economically dependent on tourism and all new buildings that are constructed within the city walls must be built with the same traditional character and beauty. Like many Italian cities, Siena is about atmosphere, but it also has a lot of sights and attractions to visit. The Piazza del Campo is a shell shaped piazza in the middle of the city. It also serves as the racetrack for the Palio. The Palazzo Publico is the city hall that dates back almost 800 years. The Duomo is beautiful and attached to it is Museo dell'Opera del Duomo. The Pinacoteca has many Sienese paintings and the Palazzo Salimbeni, which was built in 1472, is the world headquarters of a major banking corporation. Near the duomo is the house where St. Catherine of Siena was born. Finally, the Piccolomini Palace was built in 1459 by the architect, Bernardo Rossellino. Siena is divided into about 17 neighborhoods, or contrade. These neighborhoods were originally based on administrative and military needs, but now they are very tight knit communities that have a lot of loyalty. This becomes particularly apparent during the Palio. Horses during the event wear a design to represent their contrada. These include the Dragon, Eagle, She-Wolf, Panther, Ram, Unicorn, Owl, Porcupine, Giraffe, Goose, Tortoise, Snail, Caterpillar, Forest, Shell, Tower, and Wave. The most popular event in the city is the Palio Horse Race which is held twice during the summer months. In addition to this event, there are many classical concerts during the warmer months as well. They are held throughout town but most often you'll find them at the Accademia Musicale Chigiana. The Siena Jazz Festival is also quite popular. There are some great restaurants in Siena. Because the city is so dependent on tourism, it is best to avoid the more touristy spots and head to where the locals eat. Make sure that you try some of the local specialties that are unique to the area. Panforte is a type of dense cake that is made with honey, flour, almonds, candied fruits, and a variety of spices. The cake is commercially manufactured in the city and the most famous brand is Sapori. It's available for good prices in the local supermarkets but you can also pick it up in cafes around town. Ricciarelli is another local favorite. It's a small almond paste cake that is very good. Try one at Antica Drogheria Manganelli, which is located on Via di Citti 31. Siena can be reached by train or bus. There are hourly trains from Florence to Siena, but you could also take a train that stops in Empoli and then change trains to travel from Empoli to Siena. Siena's train station is located about 2 kilometers outside of the city's historical city center. It's about a five minute bus ride and you can catch a bus at the bus station inside the mall. You can catch a return bus from Piazza del Sale. Buses 3, 8, 10, 17, and 77 travel toward Piazza del Sale and bus 17 travels from the piazza to the train station. It's also possible to walk, up hill, to the city center in about twenty or thirty minutes. The much easier, although less scenic way to travel from Florence to Siena is by bus. You can take the SITA bus from an underground bus depot near the Santa Maria Novella train station. It's about an hour and a half trip and you'll arrive at the bus terminal at Piazza Antonio Gramsci inside the city walls. From there it's easy to walk to most of the city's popular sights. You can also catch a bus from Siena to Rome. The trip is about three hours. Once you're in Siena you can travel around by bus or foot. The city is small but also very hilly. Some attractions are easier to reach by following the ridge of the hill instead of going up and over. Small buses, called Pollicino, travel around some of the streets in the center of the city. There are also some routes that go outside of town. Check out Google maps for the location of the routes and stops.